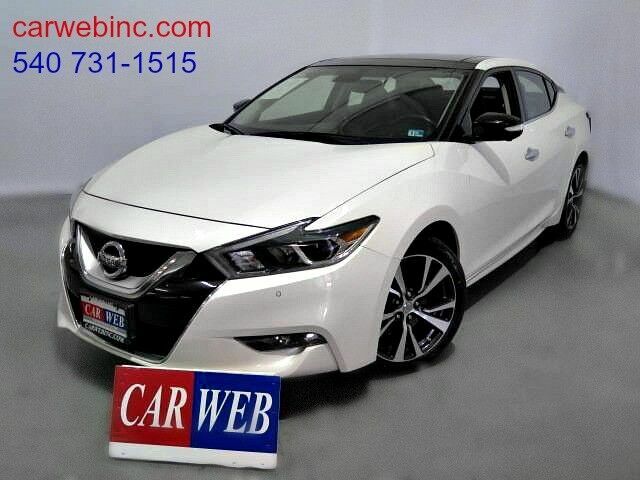 2016 MAXIMA PLATINUM WITH ***59000*** MILES JUST ARRIVED....ONE OWNER WITH GOOD CLEAN CAR FAX REPORT AND 16 DOCUMENTED SERVICE RECORDS....... Best Color combination loaded WITH OPTIONS LIKE, Navigation, Back up camera, heated/cooled leather seats, Panoramic moon roof, rear spoiler, Cd changer, Lane assist, adaptive cruise, Blue tooth, XM radio, Rear spoiler, aluminum wheels and so much more......Please visit our web site at www.carwebinc.com for more detailed information and free carfax report available on this vehicle. To set up an appointment for test drive feel free to contact our sales team at 540-371-1515 ext 1. Vehicle sold with 1 month or 1000 miles power train warranty. Prices exclude, tax, tag, title and processing fee of $649.